Univerisity Medieval table on 3 tiles. 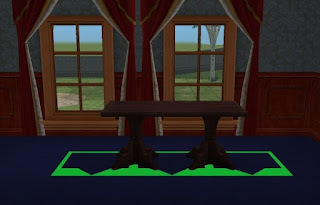 you can't really use the two side slots though, as objects placed on these slots tend to float in mid air-they sit in the air next to the table. I made this to use as a desk centred on an odd number of tiles. May require Unversity.